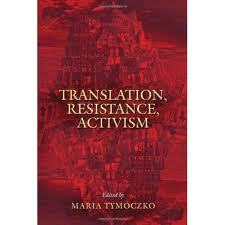 There is a book out about translation and social change, Translation, Resistance, Activism. It came out in 2010 but I just discovered it, and haven't seen it yet, since I'm living in Bogotá at the moment. I'm looking forward to it - particularly the last chapter, "the space and time of activist translation." Has anyone out there read it? Any chance any of it is available digitally? More than merely linguistic transposition, translation is a vector of power, resistance, rebellion, and even revolution. Exploring these facets of the ideology of translation, the contributors to this volume focus on the agency of translators and their activism. Spanning two centuries and reaching across the globe, the essays examine the varied activist strategies of key translators and translation movements. From silence to radical manipulation of texts, translation strategies are instrumental in significant historical interventions and cultural change. Translation plays a pivotal role in ideological dialogue and struggle, including resistance to oppression and cultural straitjackets of all types, from sexual puritanism to military dictatorships. Situated in their own space, time, history, and political contexts, translators promote ideological agendas by creating new cultural narratives, pragmatically adjusting tactics so as to maximize the social and political impact. The essays in this volume explore ways to read translations as records of cultural contestation and ideological struggle; as means of fighting censorship, physical coercion, cultural repression, and political dominance; and as texts that foster a wide variety of goals from cultural nationalism to armed confrontation. Translations are set in relief as central cultural documents rather than derivative, peripheral, or marginalized productions. They are seen as forms of ethical, political, and ideological activity rather than as mere communicative transactions or creative literary exercises. The contributors demonstrate that engaged and activist translations are performative acts within broader political and ideological contexts. The essays detail the initiative, resourcefulness, and courage of individual translators, whose willingness to put themselves on the line for social change can sometimes move the world. In addition to Maria Tymoczko, contributors include Pua'ala'okalani D. Aiu, Brian James Baer, Mona Baker, Paul F. Bandia, Georges L. Bastin, Nitsa Ben-Ari, angela Campo, Antonia Carcelen-Estrada, alvaro Echeverri, Denise Merkle, John Milton, and Else R.P. Vieira.